from zengardner.com: If you think of universal reality as a cosmic satellite radio transmission, we are all frequencies that are being picked up from the same transmitter. This satellite radio (aka: God/the Universe/love/all-that-is) offers an endless amount of stations all at once, and you can dial in to any frequency that feels best. Simply put, think of this… just because you may turn to Z100 on the radio dial, it doesn’t mean that HOT97 doesn’t exist, it’s just that Z100 is the particular frequency that you prefer to vibrate on, because this station has the melodies that move you. Others may find their rhythm from different melodies, but all of life is music nonetheless. Our frequencies in our daily life manifest in what you “frequently see”. Whether through synchronicities, miracles, hardships, or tribulation, there are always valuable lessons to be learned from what you’re attracting in accordance to your vibration. Like moths to a flame, you will always attract situations that are in exact alignment with your vibration, as every person, place, or experience becomes magnetized to you as a mirror to reflect what you’re reflecting. You can learn from the experience and vibrate higher, or these same experiences will continue to manifest themselves until your frequency changes. 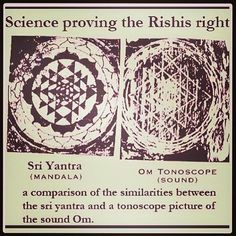 The spiritual significance of sound, frequency, and vibration has been understood by many mystery schools, Tibetan Monks, and Sufi mystics, and has been further analyzed through cymatics, the study of the visual effects of sound on matter. In the photo below, a cymatics study came to show that the Om sound frequency moves matter into the same geometric shape as seen in the Sri Yantra Mandala. So with all of this being said, when we view life as this gigantic radio receiver, and we understand we have the ability to dial in to any frequency we wish… which frequency do we wish to tune in to? The frequency which has the rhythm of love, beauty, happiness, and kindness that imprints our patterns of perfection to what we “frequently see”. Or do we wish to create patterns of chaos and destruction by vibrating at a low level and perpetuating fear, hatred, judgment and the illusion of separateness? All is free choice, and the melodies of the music of your life can move your universe however you wish. Just understand that the “music” that moves through you, moves the matter/what matters in the reality you’re creating.